The Human Division Listen-A-Long, DOUBLE FEATURE – Episodes 8 and 9! Hello, and welcome back to another listen-a-long for the Human Division. Apologies for missing all you cats the last two weeks – my wife and I just had a new baby, and it kept me pretty busy! So, I’m gonna play catch-up with this post, and then hit you up with the brand-spanking new episode: “This Must Be the Place” on Friday. So drink some highly alcoholic beverages, belch some SmartBlood, and light a match. Remember SPOILERS MIGHT BE FLAMMABLE (and they are definitely in this post), and let’s get to it! In “The Sound of Rebellion,” we’re reunited with Lt. Heather Lee, who listeners may remember from my favorite episode thus far: We’re Only Need the Heads. Unfortunately, things have looked better for Lt. Lee. While on shore leave, she and several of her comrades are abducted. We find her strapped naked to a chair, and being told that her poor redshirt friend Jefferson didn’t make it out alive because he didn’t cooperate (Sam and I are wearing our WE ARE TOTALLY SHOCKED faces). Lee is told that if she cooperates, she’ll be let go. Riiiiiiiiiiiiiight, dangerous person, we’re not allowed to see. We TOTALLY believe you. Fortunately, Lee doesn’t, and using her awesome CDF Marine SmartBlood, and her training as a musician, concocts a way to escape just when the bad guys are about to get nasty. I have to admit, it’s a pretty badass little prison break. Lee escapes by spitting SmartBlood onto her bonds, then onto her assailant, and igniting it (that’s way cool) which burns said bonds and assailant up. Then she kills her captors, and saves her surviving companion. (Sorry, Jefferson!) They’re unable to capture the Boss, but they got some of the bad guys, and live to fight another day. 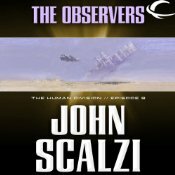 In “The Observers,” we’re treated to more sabotage aboard the Clarke, when a diplomat Harry Wilson is supposed to be observing (read: doing some friendly spying on) is assassinated. And, of course, Harry’s human counterpart is spying on him too. Scalzi does a good job of keeping us entertained. There’s mystery, intrigue, Kermit the Frog jokes, and drinking! (Of course there is drinking if there are Kermit the Frog jokes.) In the end, Harry calls a meeting with all the suspects and explains to them how the assassination was carried out. Unfortunately, Harry didn’t know all the particulars, and the suspects figure out the real culprit is missing. By the time Captain Coloma and Ambassador Abumwe are able to track her down, she shoots herself out of an airlock to a floating grave in space. Two enjoyable, serviceable episodes. Neither of them particularly blew me away, although Lt. Lee’s escape was a great ride. And after the way this series started, I admit I was completely sure she’d make it out alive, and I’m really glad she did. Scalzi’s knack for keeping us entertained is completely at play in both these episodes. Dufris does a solid job as well, with special props to him for the drinking scene. That was a lot of fun. 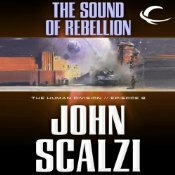 Between this episode and Redshirts, I think Scalzi seems to have a special talent for writing drunken dialogue (and gets narrators who pull it off exceptionally well). I know at some point, a shoe is going to drop, and we’re going to find out just who is manipulating the CDF, Earth, the Conclave, and also the Jedi (maybe in this week’s episode, which is apparently generating a love/hate reaction)? And I have to admit, I feel like I should care or be intrigued about it a little more than I am. Maybe it’s the way we leap away from the B-Team every other week, but right now, while the overarching series plot is serviceable, there’s just not enough there that’s really captivating me. This is not a huge complaint – The self-contained stories themselves are fun and generally pretty entertaining, but I’m not terribly worried or curious about this shadowy organization doing dark deeds in the depths of space. I’m just way more interested in the B-Team and the hijinks that ensue. 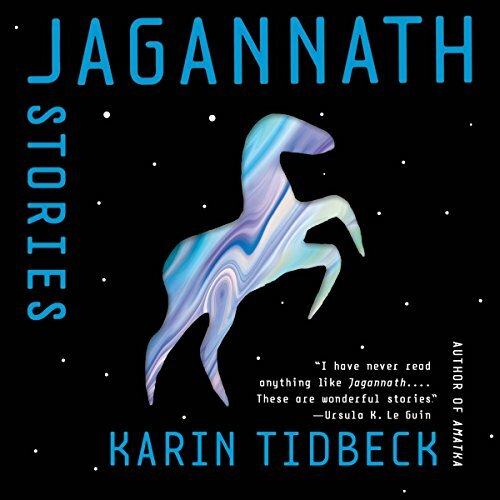 I know this is an experiement for Scalzi, and I’ll be very curious to read other reviews and reactions both from people doing the serialized version, as well as those doing story all in one go. 3 Responses to The Human Division Listen-A-Long, DOUBLE FEATURE – Episodes 8 and 9! “Sam and I are wearing our WE ARE TOTALLY SHOCKED faces” but this is like totally my first mission and I love missions and nothing ever ever could happen to me! (OK, exaggeration.) Welcome back and congrats, Dave! And if reading the intro to this in your “PodCastle episode introduction voice” is wrong, I don’t want to be right.